Adams is a top-5 player out of Washington, and a national RB recruit with ties to the region. The son of three-time Pro Bowl defensive lineman Sam Adams, Sam Adams II, was offered by Oklahoma State’s coaching staff this week. The younger Adams is a top-250 running back from Washington, ranked by 247Sports’ Composite as a consensus four-star prospect. Adams has 37 (!) offers in total, so OSU’s offer might have fallen into his lap like a penny in an ocean. Nonetheless, the Adams family has ties to the region; his father played at Texas A&M in the early 90s before a 14-year NFL career with the Seahawks, Ravens, Raiders, Bills, Bengals and Broncos. The younger Adams is a class of 2020 tailback who stands at a stout 6-2, 200 pounds. The elder Adams has a pedigree that would seemingly indicate his offspring can ball, too. He was a three-time Pro Bowl defensive lineman, and won a Super Bowl in 2000 with Baltimore. It stands to reason that because of his ties to A&M, the Aggies are the presumptive favorite to land him. But he’ll certainly have his choice; Texas A&M is among the many big programs to offer along with Nebraska, Arizona State, Washington, Ohio State, LSU, Texas, UCLA … you get the picture. “He’s got great vision and he’s a good athlete,” Adams said of his son recently via Youth1.com. “I’m a little dumbfounded about how he became such a good running back because he for sure didn’t get that from me. 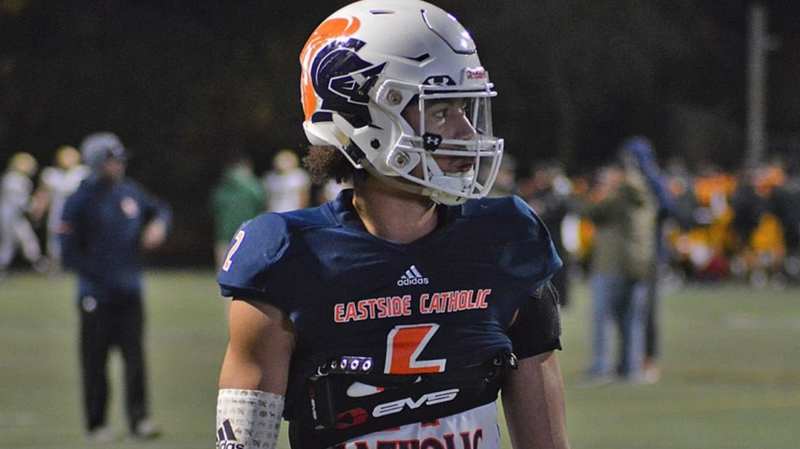 Adams was a MaxPreps Junior All-American last season, scoring 20 times and recording 929 yards rushing and 203 yards receiving for Eastside Catholic in Sammamish, Washington.